Pierre Boulle, novelist and short story writer, was born on this day in Avignon, France, in 1912. An engineer by profession, who worked as a technician on British rubber plantations in Malaya during the 1930s, he joined the Free French Forces under Charles de Gaulle upon the outbreak of World War II. He worked with resistance movements in China, Burma, French Indochina until his capture, in 1943, by Vichy France loyalists on the Mekong River. He was imprisoned and subjected to severe hardship and forced labour, which he would later write about in the form of a highly successful autobiographical novel, Le Pont de la Rivière Kwai. 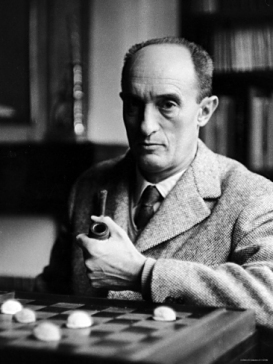 After the war, Boulle resumed his previous occupation for a time but, by 1949, had returned to his native France, living in Paris where he sought to make a name for himself as a writer. The success of his literary output is overshadowed only by the success achieved by adaptations of his work for cinema. Today, his reputation rest chiefly on two works, The Bridge over the River Kwai (first published in French, in 1952, as Le Pont de la Rivière Kwai) and Planet of the Apes (first published in French, in 1963, as La Planète des singes), both of which were made into award-winning films by Hollywood studios. The Bridge on the River Kwai (as the film adaptation was called) garnered considerable success, winning seven Academy Awards in 1958. 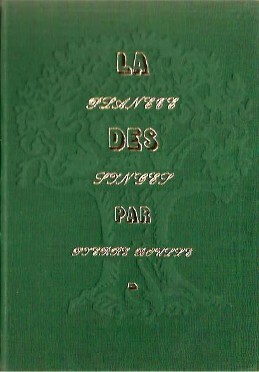 However, this was to prove a mere precursor to the sensation that Planet of the Apes would become – and to the surprise of no one more than Boulle himself, who puzzled over how the book could ever be adapted to the format demanded by cinema and, in any case, apparently considered the novel to be one of his lesser works. The idea is said to have originated with a trip to the zoo, watching and observing how animals and primates in particular, behaved. The screenplay for the motion picture deviates in many respects from the novel yet, retains all of the essential elements, including what The Guardian newspaper described as "classic science fiction ... full of suspense and satirical intelligence", in its review of the novel when it first appeared. The planet in the novel is a different planet to Earth although, the ending is not without a wry, sardonic twist, emulated only by the climactic finale evoked by Rod Serling and Charlton Heston in the film adaptation. Furthermore, the apes whom the astronauts from present-day Earth encounter, inhabit a civilised milieu though, one that is not without contradictions, including a certain capacity for casual cruelty. Pierre Boulle died in Paris, France on 30 January 1994, aged 81. His total literary output amounts to some 30 novels and short story collections. A website dedicated to his life and work is operated by «Les amis de l'œuvre de Pierre Boulle». So, how does one mark an occasion like the 50th anniversary of Planet of the Apes? We are talking here about the motion picture format, of course. The original concept is a few years older and for that, we are forever indebted to French novelist, Pierre Boulle (1912-1994). 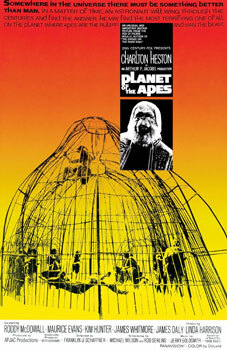 Still, it was a shrewd move on the part of Hollywood executives not to call it Monkey Planet! That would never have caught on – or would it? 50 years is not all that long a period of time when you think about it. Some might even say that life begins at fifty. Others might say that such people are perpetual optimists or even, hopefully delusional! Nevertheless, it has been proven (in quite recent times too) that it is possible to successfully re-invent a classic – even breathe new life into it – as long as one does so by remaining true to the original intent, without necessarily being in thrall to it. For ourselves – custodians of website dedicated to exploring the worlds of Planet of the Apes, from its original incarnation through all of the re-inventions and re-interpretations that have followed – the best way that we can mark this auspicious milestone is with a re-boot of our own. Thus, we present to you (our readers), our new website, which, to all intents and purposes, is much the same as our old website except that, the old one was falling apart – a veritable madhouse, a madhouse, we tell ya but let's not get into all that. We hope that you enjoy the new incarnation, for however long it remains and that you will visit regularly. There is no telling what the future may hold but, we do look forward to bringing you regularly updated content, about all matters pertaining to the cultural icon that has teased, provoked and delighted people for more than half a century.